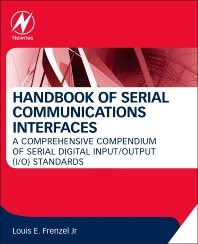 This book catalogs the most popular and commonly used serial-port interfaces and provides details on the specifications and the latest standards, enabling you to select an interface for a new design or verify that an interface is working correctly. Each chapter is based on a different interface and is written in an easy to follow, standard format. Louis E. Frenzel Jr. has been a Technology Editor with Electronic Design magazine since 2000 and covers the wireless, communications, and networking and test/measurement fields Lou has over 30 years of electronic industry experience as an engineer in the geophysical, aerospace and computer fields. Prior to joining ED he was a college professor teaching electronics and semiconductor manufacturing and working on several NSF grants. He holds bachelors and masters degrees and is author of 21 books on communications, computers and electronics. I bought it to get more detail about serial communication protocols, however, It is too abstract than I expected.